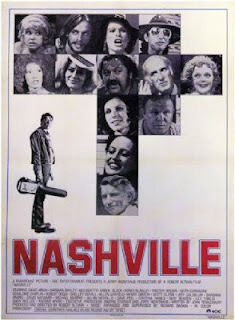 Tag line: "The Home of Country Music"
Along with directing a number of great films, including MASH, The Player and Short Cuts, Robert Altman also turned out two masterpieces. The first is McCabe & Mrs. Miller, a very unique western and one of my all-time favorite films. The second is 1975’s Nashville, a picture that shies away from story and plot to instead focus on its huge cast of characters. Set in the country music capital of the world, Nashville brings together 24 people over the course of several days. John Triplette (Michael Murphy) has just arrived in town to organize a political rally for independent Presidential candidate Hal Philip Walker. With the help of local lawyer Delbert Reese (Ned Beatty), Triplette hopes to coax some of country music’s biggest stars into appearing at the event, including egotistical superstar Haven Hamilton (Henry Gibson), and the frail and sickly Barbara Jean (Ronee Blakley), who’s managed by her husband, Barnett (Allen Garfield). Also in town is a famous folk trio, whose front man (Keith Carradine) is a sexually obsessed Casanova hoping to add another notch to his bedpost in the form of gospel singer Linnea Reese (Lily Tomlin), Delbert’s wife. Along with the musicians, Nashville gives us the wannabes, like the talentless Sueleen (Gwen Welles) who dreams of being a singer, and the pushy Albuquerque (Barbara Harris), always on the lookout for someone who’ll give her a shot at the big time. Then there are the newcomers to Nashville, such as L.A. Joan (Shelley Duvall), in town to visit her uncle (Keenan Wynn), and Opal (Geraldine Chaplin), who’s just flown in from England to produce a documentary for the BBC. Each of these individuals, and more besides, will turn up at Hal Philip Walker's rally, setting the stage for a finale as shocking as it is dramatic. The basic premise of Nashville, organizing a political rally, is simply an excuse to bring these characters together. We get to know most of them quite intimately, and a few even manage to surprise us along the way. Take Haven Hamilton, for instance, who, when we first meet him, is in studio, recording a patriotic ditty titled Two Hundred Years. Complaining the piano player is off-key, Haven stops the session several times, finally walking out in disgust before the song is finished. In this scene, and through much of the film, Haven comes across as an overbearing blowhard with a mighty high opinion of himself. Then, all at once, when something terrible happens, we’re shown another side of Haven Hamilton. It’s not as if he’s undergone any substantial personality change; this is a strength Haven always possessed, concealed behind his pomposity and pride, and suddenly, we find ourselves admiring him in spite of his faults. Like a number of the individuals we’re introduced to in Nashville, there’s more to Haven Hamilton than meets the eye, and it’s the gradual revelation of its characters' many layers that makes this movie such a rewarding experience. I think MASH is Altman's masterpiece. I also enjoyed The Player. I was pretty disappointed in this. I guess that's the nature of a "Masterpiece," they tend to be love it or hate it things. Haven't seen McCabe and Mrs. Miller yet. One if my favorite movies, though I agree definitely a notch below McCabe (McCabe may be my favorite movie of all time). Each has inspired other filmmakers, by the way. Winterbottom's The Claim is obviously has attempt at McCabe & Mrs. Miller, and Magnolia is Anderson's attempt at Nashville (it even has two of the same actors).